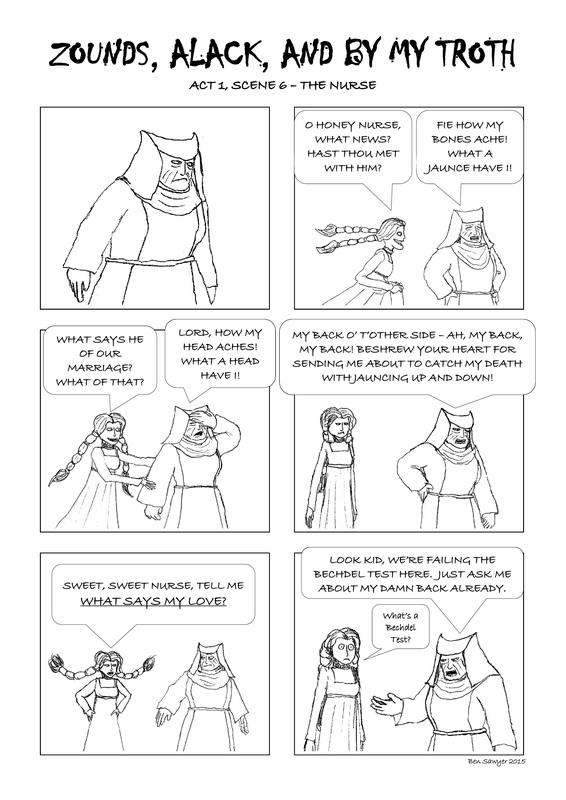 This comic was posted in Romeo and Juliet, webcomic and tagged Bechdel test, comic strip, comics, humour, Juliet, Nurse, Romeo and Juliet. I know this text well as I taught it for several years as many as fiv times a day and I don’t get it either. I personally do not know much of the literature work, but this comic is amazing. Giving picture to the characters and not just the face but the detailing part. The piggytails are cute..
All I could think of was Yoda through this whole thing! Thanks for all the likes and comments, look out for a new cartoon tomorrow! Hahaha, somehow I don’t think that’s going to be enough to pass the test. Very amusing! I’ve decided to follow you. I need more cartoons about Shakespeare and gender equality (and probably whatever else you can throw at me 🙂 in my life. love it. If Shakespeare had to worry about nonsense like the bechdel test we would have a story about a nurses back pain instead of two star crossed lovers. Very nice work, hope to see more work like this in the future. I’m sure I missed some depth to it, but maybe I’m trying too hard :p I thought it was great! I’m still laughing and I don’t get it. A brilliant twist there! Very funny! lol, I love that! I hope you continue to do more like this.